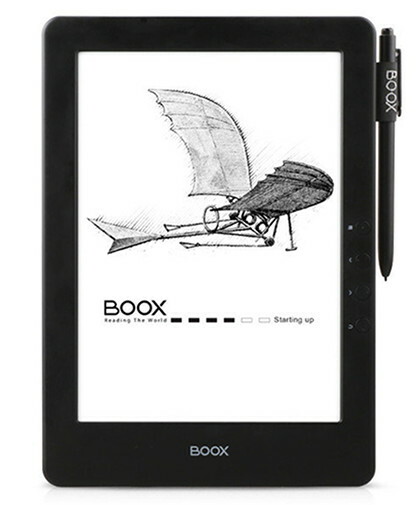 The Onyx Boox N96 is a line of 9.7-inch E Ink ereaders from Onyx. There are several variations of the N96. 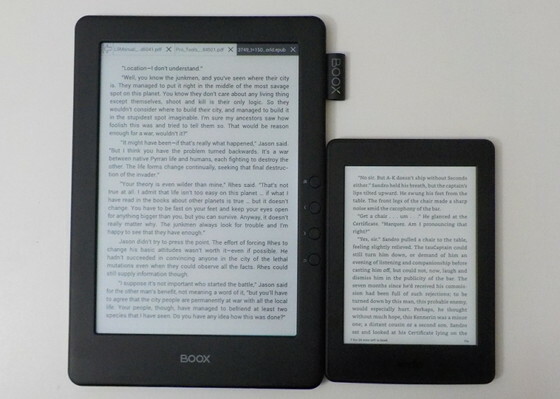 The older versions have E Ink Pearl screens and the newer ones have E Ink Carta displays, the latter has darker blacks and a lighter background for improved contrast. Some versions of the N96 have a capacitive touchscreen for finger touch, and others only support stylus touch. There’s also a dual touch model that supports both, but it lacks a frontlight. The specific model reviewed here is the Onyx Boox N96ML Carta+. This model combines a frontlight with a stylus touchscreen. Personally I would have preferred to get a model with a frontlight and capacitive touchscreen, but so far that model only exists with an outdated Pearl screen, and the Carta screens looks better so I’m glad I went with it. One thing to note, I purchased the Boox N96ML from Banggood, a Chinese wholesale website. It took about 2 weeks to arrive from China. At the time it was on sale and cheaper than the one sold on Amazon so that’s why I ordered it from there instead. It came with a cover that automatically wakes and puts the ereader to sleep, and it also came with a secondary hard travel case with a zipper that is quite nice, but the hard case wasn’t mentioned in the description, only the PU case, so I was surprised it came with it. The ones on Amazon don’t mention anything about coming with a cover at all so keep that in mind. Wide range of features, including audio support and text-to-speech, with multiple reading apps to choose from. Frontlight looks good, surprisingly even on the larger display. The 9.7-inch E Ink Carta screen looks great, and is a nice option for PDFs. Solid build quality and the design is much nicer than the previous M96 models. User interface confusing and unintuitive. Sometimes random lines appear when writing on screen with stylus. Most 3rd-party apps either don’t work well or are incompatible with such an old version of Android. The Onyx Boox N96 is a much cheaper alternative to the Sony DPT-RP1 and Remarkable, and the software is a lot more advanced for PDFs and ebooks, but there are some drawbacks. The touchscreen and operating system have some quirks and the device is rather heavy, but the Carta display looks good, and it’s nice to have a frontlight on a larger screen. If you’re looking for a good PDF reader the N96 fits the bill, but don’t expect most 3rd-party apps to work well if at all. Looking back at the previous generation Onyx Boox M96, a lot of the hardware features remain the same, but the N96 comes with some notable upgrades. First off, the overall design is much nicer and the build quality is better. The M96 felt like cheap plastic and made creaking noises just handling it normally. The N96 on the other hand feels very solid and it has a classier design with an aluminum back, and it adds a loop on the top right to hold the stylus. It has four buttons, two for paging forward and back, one for going back, and one for menu. If you hold the back button you can turn the frontlight on and off, and if you hold the menu button you can force a full page refresh. On the bottom edge there’s a power button, a microSD card slot, a 3.5mm headphone jack, a USB port, a microphone, and around the back edge there’s a small speaker. The resolution of the 9.7-inch screen is 1200 x 825, for 150 ppi, but the contrast is quite a bit better on the newer Carta screens, the background is lighter and text is darker than the older Pearl screens. What I really like about the Onyx Boox N96ML is the fact that it has a frontlight. The N96 is the only ereader with a larger screen that has a frontlight. The light helps make it more useful without having to rely on external lighting, and you can turn the light off when you don’t need it. Plus the light helps improve contrast by making the background lighter. I was surprised by how even the frontlight is on the N96; there aren’t any weird cones or shadows. I had assumed even frontlighting would be more difficult to achieve with larger displays, but that’s not the case at all. The only negative is there’s a brighter strip that’s visible on the right side of the screen near the buttons. It’s hard to notice with the light at lower levels, but it stands out with the brightness turned up. It seems like the light layer doesn’t go far enough under the bezel to hide this strip, probably because the buttons are in the way. This version of the Onyx Boox N96 supports stylus touch only. It uses an electromagnetic stylus with a hard plastic tip that doesn’t seem to wear down like the Sony and Remarkable styluses. The downside with that is it doesn’t feel anything like writing on paper, as those two devices do. It feels like writing on hard plastic with a slight rubbery quality. The speed of writing with the stylus is faster than I expected. It’s actually faster to respond than the Sony DPT-RP1, but not quite as fast as the Remarkable. The stylus has no battery so it doesn’t need charging and you can flip it over and use the other end as an eraser. For the most part the stylus is accurate, but sometimes random jagged lines appear when writing on the screen. Also the touchscreen is prone to ghost touches, sometimes activating something I haven’t touched. The touchscreen works well at times but overall it’s quirky and less reliable than other touchscreens. One big negative is if you ever lose or break the stylus, the device becomes pretty much useless. You can use the page buttons as arrows to move a cursor on the screen and open the menu but there’s inexplicably no way to select things without using the touchscreen so button navigation is completely pointless. With a 9.7-inch display, the N96 is a lot bigger than a typical 6-inch ereader like a Kindle. It’s also a lot heavier. It feels like a solid brick. At 480 grams, the N96 is quite a bit heavier than the 13.3-inch Sony DPT-RP1 (349 grams) and 10.3-inch Remarkable (350 grams), both of which use lighter and more durable plastic-based screens instead of glass. Since I’ve been using those two devices lately, the weight difference seems greater than it is. While the N96 feels really heavy to me now, the Kindle DX was 55 grams heavier, so the N96 is far from the heaviest ereader I’ve reviewed. The N96 has Wi-Fi and Bluetooth. It supports audio and text-to-speech. It has a headphone jack and built-in speaker. The speaker isn’t very loud and it doesn’t sound very good but it’s there. For storage it comes with 16GB of internal space (about 12GB usable) and there’s a microSD card slot for cards up to 32GB. It has 1GB of RAM and the usual 1GHz single-core processor so speed isn’t its strong suit and some patience is required. Battery life seems to be pretty good with the 3000mAh battery, but it’s hard to tell after just a few weeks of usage. It probably lasts 1-2 weeks on average. The Onyx Boox N96 runs Android 4.0.4. At this point that’s both an advantage and a disadvantage. It’s an advantage in the sense that the software is open to installing Android apps to further enhance the functionality, and it comes with Google Play to install apps, but it’s a disadvantage by being such an old and outdated version of Android. Most apps either don’t work with Android 4.0 or they don’t work well with E Ink period. After trying to install the new Kindle app and having it crash repeatedly, and not having any way to install Dropbox on this version of Android, I decided I’m not going to use any third-party apps on the N96. If you can live with that compromise the N96 is pretty good at what it does. It has four reading apps built-in, including OReader, FBReader, Neo Reader, and Neo Reader v2. Other apps pre-loaded on the N96 include a web browser, calculator, calendar, clock, dictionary, email, gallery, music, notes, reading stats, search, and sound recorder. Depending on which app you’re using, there are a number of reading features, especially when it comes to PDFs. The software is a lot more advanced than the software on the Sony DPT-RP1 and Remarkable. Basically everything they lack the N96 has. There are various zooming options, with settings for PDFs that have multiple columns, there’s auto crop, manual crop, fit to page and fit to width, landscape mode. Screen scrolling is smooth and so is paging forward and back. Neo Reader 2 supports having multiple documents open, with tabs at the top to switch between them. You can control contrast to darken the text, add notes, highlights, lookup words in the dictionary and use text-to-speech. There are plenty of navigation options. You can enter page numbers, view multiple pages at once, use hyperlinks and footnotes, search, there’s table of contents support, and it keeps track of previous pages so you can go forward and back. On the negative side, the user interface is confusing at times and functions aren’t always obvious (it doesn’t help that the user manual is in Chinese). You can add handwritten notes to PDFs but not ePubs. You also have to enter a special notes mode to write on the screen, and you can’t scroll, add highlights, or access the dictionary without manually exiting notes mode. Overall the Onyx Boox N96 makes for a good PDF reader and an okay ePub reader, but installing apps is too hit or miss so if you can’t live with the built-in apps you should probably consider something else. I am scheduled to get my Remarkable in about 3-4 weeks so I am still able to get a refund. Question: My main reason for the Remarkable is to take notes in meetings and save them in folders based on the main topic of the meeting. Given that is my main use, which would you recommend? Thanks for the reviews. One aspect that is particularly important for me that you don’t seem to touch on is organization. I work with 1000 of PDF files and I need something that will allow me to quickly create folders, add files to folders and then move files from one folder to another and or copy a file to another folder. Also, it’s important to be able to export notes taken in the pdfs… can you comment on the file organization capabilities of Onyx Boox N96? Thanks in advance! It uses a thing called sub-libraries instead of folders. You can create sub-libraries and move files into them, but you can’t create sub-libraries within sub-libraries, and they don’t appear as folders on the drive—seems to be a software thing only. The process is rather slow and laborious and with 1000 files it would probably be a major headache to manage. However, you don’t have to use their library manager at all; you could just setup folders on a memory card and use a file manager app, for instance. Awesome, that is definitely an option. Do you know if it’s compatible with google drive or any other cloud software? Thanks again! Hard telling. Dropbox says it’s incompatible. An older version might work but who knows. I tried Google Drive and it seems to work but then neither of the onboard PDF readers will open the files. Things rarely work how they’re supposed to with Android apps and E Ink. Most of the time it’s just not worth the hassle of using 3rd party apps. Nathan, can you work in Gdocs (google docs) on this and/or MS Word app ? Both say they’re incompatible with the device and can’t be installed. Thanks. That settles it… I need drive and gdocs. Wish there was a big screen eink device that could. Thanks for this review. I want to replace my Kindle DX with something more note friendly that has backlighting. I’ve read many articles saying it was trash but now i understand that was because they were trying to run apps on it. I need it for school that’s it. This should work perfectly. Hi, i am currently using a Gen 3 Kindle (non touch screen, no backlight) for my ebook reading. i like the light weight and portability but the small screen and need to flip pages often is starting to get to me. This N96ML carta appeals to me for the large screen size and built-in backlight but i am slightly concerned about its weight. do you reckon there’s an issue holding it for reading for long periods of time? im 35year old man, medium build. thanks for your insights. cheers. It depends on how you use it. I keep it in the cover and that adds a lot of extra weight, about 230 grams more. But I usually have it sitting on a desk or propped up against something when I’m using it. On its own the N96 is about the same weight as a typical 10″ tablet. According to my scale it weighs 489 grams. By comparison the Fire HD 10 weighs 503 grams and the latest 9.7-inch iPad weighs 468 grams. So on it’s own it’s not like it’s super heavy but as far as E Ink ereaders go it is one of the heaviest. Even the larger models weigh quite a bit less because they have flexible screens. The Sony DPT-RP1 and Remarkable both weigh about 350 grams, and that does make them feel more comfortable to hold. Thanks for the review, it’s been a great help. One problem I’m having is getting the Neo Reader 2 4-document tab to work. It would be really useful to have. Are there system/screen setting that need to be changed? (I’m using Onyx Carta N96). Thanks for any help you can offer. It should just work automatically, but sometimes there’s a bug where the feature disappears. Try rebooting and see if that helps.